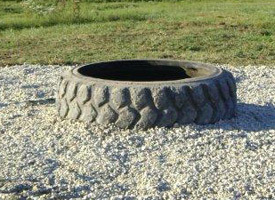 The tire tank is made of recycled OTR tires and made to be a long-lasting, safe, energy-free livestock tank that can withstand almost anything Mother Nature can put it's way. 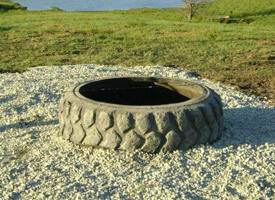 The tire tanks are approved with the USDA Natural Resource Conservation Service. Tire Tank Kits come complete with 1” stainless steel Water valve w/weep, top-adjust float (adjust water level from above water), stainless steel hardware for water line hookup, 2” drain system (overflow w/flex joint, bottom drain plug, 20’ drain line).